For some time I’ve been considering the best way to approach doing our own version of the famous T3 series. The original series is rightly famous for its stunning color and charming portraits. Indeed, many feel that it is the most beautiful sports card set of the early 1900’s. They may well be right. To acquire a single card, a collector would accumulate ten coupons found in packages of Turkey Red, Old Mill or Fez cigarette brands. He would then mail them off to the S. Anargyros company in care of their “BASEBALL AND ATHLETE PICTURE DEPT., Drawer S, Jersey City, N.J”. But back to Helmar and our own project for a moment. When trying to do something that would be relatively consistent with the originals, I’ve struggled some with what media would be best to use. Acrylics and colored pencils I can rule out immediately. Watercolors were a possibility but they tend to have a loosey-goosey appearance. After making some test paintings in gouache (watercolors with white lead added) and with oil pastels, I am tending toward using the later. Achieving detail on the figure is both a challenge and time consuming ( painting with oil pastels is very much like painting with your wife’s lipstick) but the colors are so intense that I think it may be worth the extra effort. 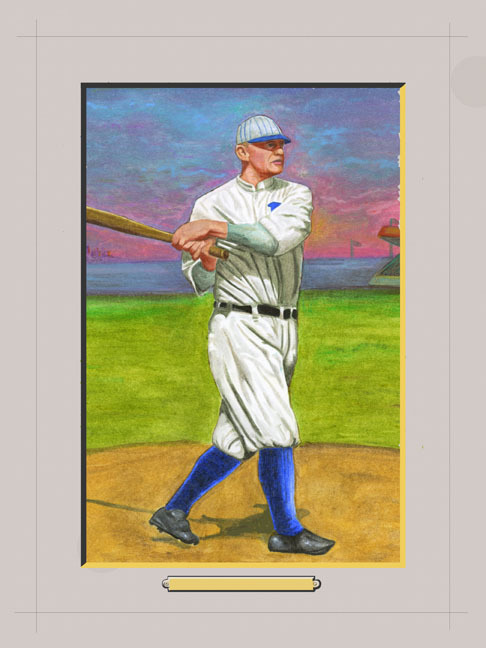 Shown below is a WIP (work in process) mock-up of a possible T3-Helmar of young Casey Stengel. It needs some work but I was anxious to get some idea of what a final product might look like.